The following is a list of 200 most common WhatsApp abbreviations and acronyms. The rate at which abbreviations are used in today’s fast-paced environment is at an all-time high. Learning the lingo as you go gets confusing, but thankfully there are much easier ways to familiarize yourself with the latest abbreviations. Below is a detailed list of the most common short forms of words used in WhatsApp; Along with these abbreviations are their exact meanings. No one likes to feel left out, now no one has to. 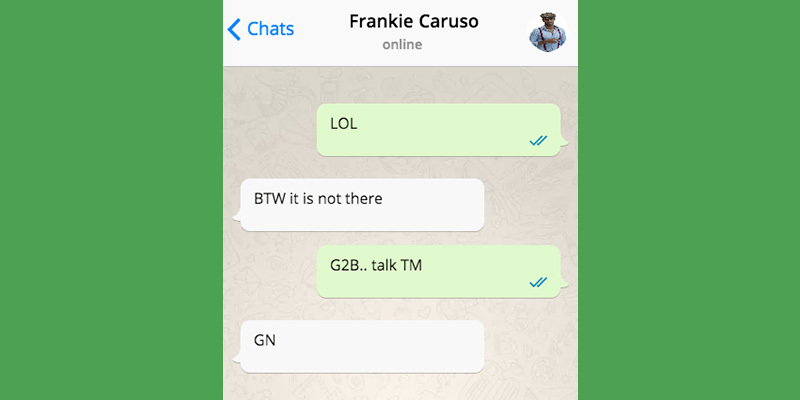 With this updated list of abbreviations used in WhatsApp chat everyone can converse. Abbreviations can be used by anyone, but if you don’t know the correct way to use them you could find yourself in a tricky situation. For instance, It is quite common to see the abbreviation “LOL” being used as the phrase “Lots of love”, however, this is incorrect. The correct meaning of LOL is “Laughing out loud”. Fortunately, easy mix-ups like that one are avoidable. To save you time and effort, below is a list of abbreviations used in WhatsApp chat; Simply refer to this list anytime you find yourself uncertain. Feeling overwhelmed? Don’t worry! You don’t have to memorize the entire list. Take the stress out of online socializing by using the above list as a communication guide. If you happen upon an abbreviation that is not on the list just remember, GIYF! Please feel free to leave a comment below if you have any questions, or if you simply want to say hello!